Bungie’s long-awaited original creation after leaving Halo behind is fun and ambitious, but marred by a confusing story and basic objective design. When you look at the landscape of video games today, it doesn’t take a genius to see that the first-person shooter (or “FPS”) is one of the most absolutely dominant genres. Every year, each successive Call of Duty game seems to break new sales records, people went mad for new entries in Wolfenstein and Borderlands, and the entire Xbox platform is defined by Halo. Gaming is far from one genre, though, and one of the other most popular ones has to be the massively multiplayer online roleplaying game (or “MMORPG”). Even though it’s nearly ten years old, World of Warcraft is still the standard by which all others are based, with nearly seven million players by the last official tally earlier this year. Other notable releases in that genre include whole worlds based off of other licenses, like MMOs based on the worlds of The Matrix, Star Wars, Star Trek, and both the DC and Marvel Comics universes. But not a lot of developers have tried to meld together the two dominant genres of FPS and MMORPG into something that is actively successful, and not merely just a gamer’s pipe dream. At least, not until now. Bungie helped revolutionize the first-person shooter with Halo: Combat Evolved, which automatically puts a lot of pressure on their next original creation. While the first-person shooter was likely first popularized by Doom in the 1990s, the next decade saw an element of stagnation in the genre until November of 2001. It was that month that Microsoft got into the video game console business with the release of the original Xbox, and a relatively uneventful launch lineup of titles had a powerful gem in its presence: Bungie’s Halo: Combat Evolved. Halo proved to be the Xbox’s “killer app,” defining the entire platform of the original Xbox for three years, until the arrival of its direct sequel. Halo 2 expanded on everything that the first game had to offer, but it also had a new major weapon with it: its online functionality basically helped to give birth to Xbox Live as we know it today. You see, Bungie was acquired by Microsoft in the year 2000, and created the original Halo trilogy for the original Xbox and Xbox 360 over the next seven years. In October 2007, though, it was announced that Bungie had split from their former parent company, with Microsoft retaining the rights to the Halo intellectual property. The partnership didn’t immediately end, though, as Bungie had developed two more successful Halo games exclusively for the Xbox 360 platform: 2009′s Halo 3: ODST, an expansion of events from Halo 2, and 2010′s Halo: Reach, a prequel to the events of the original game. After the release of Reach, Microsoft announced that they had created their own internal developer to handle future iterations of the Halo series, and Bungie announced it was moving on to other things. It wasn’t too long before it was announced that they had entered into a ten-year partnership with publisher Activision, which would see the creation of a brand-new intellectual property in at least three games through 2020. Over the next few years, we got glimpses and hints at what exactly their new game was, but many people had the impression that it was going to be ambitious, unique, and big. Now that it’s released, it’s definitely all of those things, but do they combine into something good? 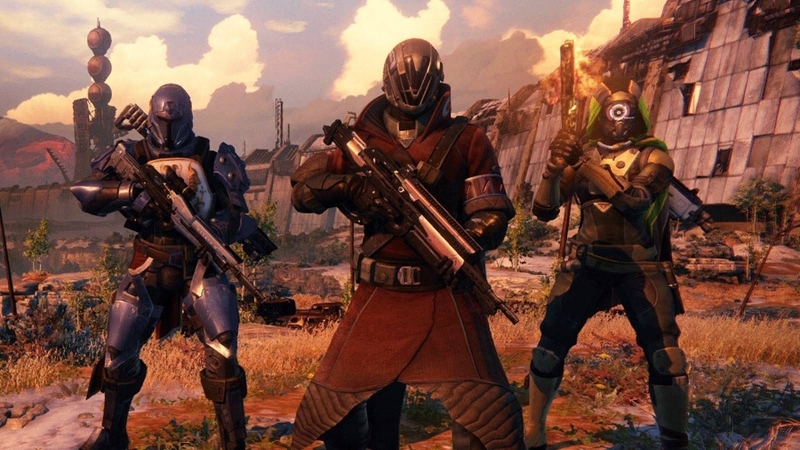 From L to R, the game’s classes: Titan, Warlock, and Hunter. The social element is one of the best parts of playing Destiny, but it’s unfortunate that story missions can only be taken on by teams of three. Four would’ve been better. Destiny is, for all intents and purposes, a hybrid game. It’s part first-person shooter that is clearly influenced by Bungie’s own genre-defining work on Halo, and part MMORPG that only feels passively inspired by the likes of World of Warcraft. It has fast-paced and intricate FPS gameplay mechanics, along with a clearly defined social element and upgrade ladder that is specific enough to be almost procedural, but also open-ended enough that it doesn’t force the player to accomplish their goals in any specific way. Some players will absolutely thrive in an open-ended gaming environment, but others may be put off by the sheer size and relatively minimal sense of direction with which you can upgrade your character. Like a lot of MMOs, Destiny‘s gameplay experience is built around your initial choice of which kind of character you want to play as. There are three classes to choose from: Titans are the most heavily armored class, with emphasis on strength and brute force to get the job done. As the traditional “tanks,” they can go a long way in both defending other players in their fireteam or in multiplayer modes, or just be absolutely devastating in their attacks. The next class, the Hunters, are the fastest and most precise of the three. Often utilizing knives and trademark precision, Hunters are purely offensive players who use agility and stealth to get the job done. The final class, Warlocks, are kind of like wizards: they use the “Light” of the mysterious alien protector known as the “Traveler” to walk the line between physical and mystical realms, using some pretty mesmerizing attacks that help channel the metaphysical energies of the world around them. These three classes and the choice that a player makes between them help to define what the rest of the game is going to be like. Before getting into the gameplay experience, though, service needs to be paid to the design and immense thought that has gone into the game’s lore. This is your ‘Ghost,’ a robotic companion that helps you during missions and takes you through the story. It’s voiced by Peter Dinklage, who seemed to kind of phone it in. The story of Destiny is a lot of things right up front: it’s vast, sweeping, and space opera epic, but it’s also kind of muddled and unclear in a lot of places. While the initial stakes are made clear in the very first mission, and some of the important details are spelled out sufficiently, in some ways the game is too caught up in its own lore, which results in a bit of a haphazard narrative experience. That in and of itself isn’t a negative critique. This is a shooter, and it’s unreasonable to expect the primary game function to go out the window when you’re talking about shooting enemy aliens in the face. From a story perspective though, the narrative doesn’t give sufficient context to what’s happening at all times, and this is often exacerbated by the cryptic riddles that many of the characters seem to speak in, in lieu of actual exposition. Sometimes while playing, it’s easy to just get caught up in the detail and beauty of the environments. This shot on the Moon is a good example. The basic story is that it takes place seven hundred years in the future. When humanity first lands on the planet Mars, roughly around, “present day,” we encounter a large spherical alien entity known as “the Traveler.” Our meeting the Traveler helped to enable the “Golden Age,” a period of unprecedented prosperity and technological advancement that allowed us to colonize previously inhospitable planets in our solar system, such as Venus and Mars, as well as functional work stations on the Moon. Human life expectancy tripled during the Golden Age, and the Traveler used its mysterious, undefined power — simply known as “the Light” — to protect us. When the Traveler’s enemies arrived, though, it signified the beginning of “the Collapse.” Humanity was driven out of the other planets of our solar system back to Earth, and these alien enemies overtook them for their own uses. The Traveler seemed to use the last of its active power to protect us, and retreated back to Earth itself, hovering above the surface. The remnants of humanity built the City — our last refuge — underneath the Traveler. Not long afterward, the Traveler sent out the robotic Ghosts to find humans and others worthy of wielding the mysterious Light to act as protectors, or “Guardians,” of the rest of humanity, and start taking the fight to our enemies. When you begin the game, you are a newly awoken Guardian — having been dead for centuries — and you begin your journey to help the inhabitants of the city take back our solar system by wielding the Traveler’s Light. Pretty sweeping, but the details can often be lost in translation. What the game may sometimes lack in narrative coherence, though, it makes up in absolutely jaw-dropping design. Running at 1080p and 30 frames-per-second on both Xbox One and PlayStation 4, Destiny is hands-down the best looking video game I’ve played all year, taking full advantage of the newer hardware to provide detailed environments, lush landscapes, and a vibrant color palette. The story of the game takes place across our solar system, on Earth, to the red hills of Mars, the magnificent desolation of the Moon, and even the yellow skies and massive mountains of Venus. Of course, the sweeping beauty of the environments means very little in a game without solid level design, and while the missions can prove to be somewhat linear, the placement of enemies and the toughness of the bosses in most cases make this easily forgivable. Which, of course, leads to the most important element. In a lot of ways, it’s difficult to try and boil down the entire gameplay experience of Destiny into just a few paragraphs because it’s so utterly massive. From choosing a class, creating your character, leveling up, choosing your gear, assembling a fireteam, playing PvP, playing PvE, and communicating your goals with fellow players, there’s just a lot of game here to cover. The simplest way to do it is just to reiterate what was already said at the top of this review: this is a hybrid game. It takes all of the specific gameplay elements of MMORPGs when it comes to leveling up, choosing the right equipment, and trying to organize missions with other players, but puts it within the parameters of first-person shooter gameplay. For the story missions, or “player versus environment” (PvE) missions, you can choose two friends to play alongside as you head toward a massive boss fight on any one of the planets, or in the story missions which incrementally reveal more details about the rather unclear series of events. The game is absolutely made by the social element, though. While you can progress through the various missions on your own as long as you progress to a high enough level, Destiny is a game that’s made to be played with friends. Jumping into a PvE story mission or a special boss fight (or “Strike”) is really satisfying when you’re communicating with your buddies over voice chat on Xbox Live or PSN, but good and effective communication with team members can also be a decisive factor in victory. The PvE missions aren’t exactly a cakewalk either, especially if you decide to pump up the difficulty, making a well-rounded team that can communicate well all the more important toward your ultimate success in progressing through the lower levels. The opening screen to a PvP “Crucible” game, where most will decide if Destiny lives up to the Bungie legacy. But of course, one of the biggest indicators of Destiny‘s ultimate success will be in online multiplayer. The studio that basically helped to define the last three generations of online shooter gaming have a lot to live up to when it comes to crafting the game’s player vs. player (or “PvP”) element, and the good news is that Halo devotees will find a great deal on which to thrive. The bad news is that some serious balance issues can hamper the overall experience rather dramatically. Bungie has named the PvP element of Destiny “the Crucible,” which basically means you and a team of Guardians are facing off against other players in some relatively typical game types for FPS games. “Control” demands that the teams capture and hold specific zones on the map, “Clash” is your basic team deathmatch mode, and “Salvage” combines the team deathmatch concept with an objective-based game to secure pieces of technology before the other team. Playing the Crucible in lower levels will likely be a supremely frustrating experience for the player, but what will be universally frustrating at every level is some of the lack of balance. For instance, pretty much every Crucible game type favors one weapon over all others: the shotgun. You may be a level 25 with certain enhancements to your defense level granted by armor and passive abilities, but a level 8 could bust in and shoot you with a shotgun for instant death. This is something that needs to be remedied in a future update, because while the majority of Destiny allows for an open-ended gameplay experience at pretty much every level, Crucible gameplay almost always forces players to attack a level in a specific way, and with a specific weapon. Overall, the fundamentals of PvP gameplay in the Crucible are sound, building on the proven mechanics of the Halo series while introducing the MMORPG elements as crucial. Matchmaking could be improved, though, matching players up with more evenly skilled or leveled opponents. If you have enough friends in a game for a 6v6 match you’ll have a good time, but the Crucible is one of the most frustrating elements of Destiny, which isn’t a good thing. The option to upgrade from a digital last gen copy and have the same game waiting on your system’s successor is a great option while we’re in that nebulous transitionary period between old and new hardware. Thankfully, both last gen and new gen versions of the game represent everything it has to offer very effectively. One of the cool things that Bungie has done with Destiny is think in practical terms about the current situation with multiple platforms. While tens of millions of gamers are still using their Xbox 360s and PlayStation 3s, they understand that consumers are at a period where it’s likely time to upgrade their gaming hardware. While we’ll likely get at least two more games out of the Destiny franchise, this first game will likely be the only one that sees a 360 and PS3 release, and to that end, Bungie and Activision have sort of “future-proofed” Destiny. One of the most obvious things that they did is share all character details, upgrades, and achievements/trophies within a console family. While you’ll be out of luck if you transition from an Xbox 360 to a PS4, if you move from Xbox 360 to Xbox One or from PS3 to PS4 and start playing Destiny on the older system, your same character and unlocks will be waiting for you on the newer system. Everything is stored in the cloud, so making the transition is now easier than ever. They took it a step further, though, by making the digital copy of the game on older hardware unlock the game on newer hardware for free through January 15th as a part of the Destiny digital upgrade program. Curious about this, I purchased the game digitally on my Xbox 360. Since my 360 and Xbox One are tied to the same Microsoft account, I navigated to the Game store on my Xbox One, and downloaded the newer version of the game absolutely free. So, as a result, I got to try out the game on both old and new gen systems, and can report to you the differences: there are none, from a functional perspective. Similarly to the Xbox 360 version of Titanfall, this plays like the same game. No matter how you slice it, this is definitely Destiny. Where it outdoes the 360 version of Titanfall, though, is in the graphical department and overall function. Titanfall on the old gen had some noticeable sputter when things got a little too hot for the hardware, but Destiny on older hardware had its graphics optimized perfectly. There is no functional slowdown even in intense situations. So, you need not be hesitant about jumping into Destiny on older hardware, and sweetening the deal for digital customers is definitely the free upgrade through January 2015. Destiny is an extraordinarily ambitious game, but generally with that kind of ambition comes some kinks that a developer has to work out. Everything about this game screams a top-of-the-line video game experience, and in concept that is absolutely true about it. When it comes down to the details, though, things can get lost in the mix. The narrative seems very promising, with the environmental scope of Star Wars and the narrative grandeur of The Lord of the Rings, but it loses an important relatable element when you try and find out just what the hell some of the characters are talking about. The MMO elements all make for a welcome new dynamic in the FPS genre, but it would definitely help if players could understand a bit more about what they were doing, and why exactly they’re doing it. Building off of the proven Halo formula for the multiplayer modes brings an inherent strength, but that’s quickly hampered by some serious balancing issues that need to be addressed if Destiny is to truly become the successor to Halo, even in the context of Bungie’s own legacy. Still, though, this is a very good game. Issues aside, the ambition and scope, in addition to the engaging social element all make for a game that seems tailor-made for a new generation, and spells a lot of exciting things not just for Bungie, but for other developers as well. 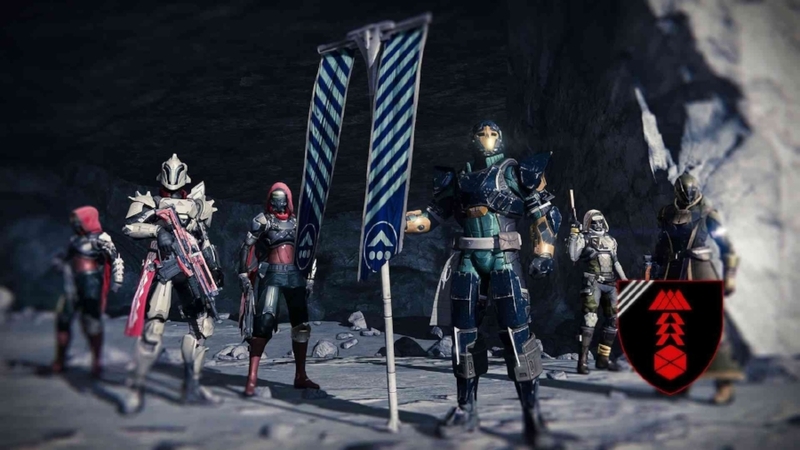 Destiny is very much worth playing and can definitely become quite a time vampire, but in a way, all of the issues can be forgiven if you find yourself enjoying a hell of a romp across the surface of the Moon with some of your best gaming friends.